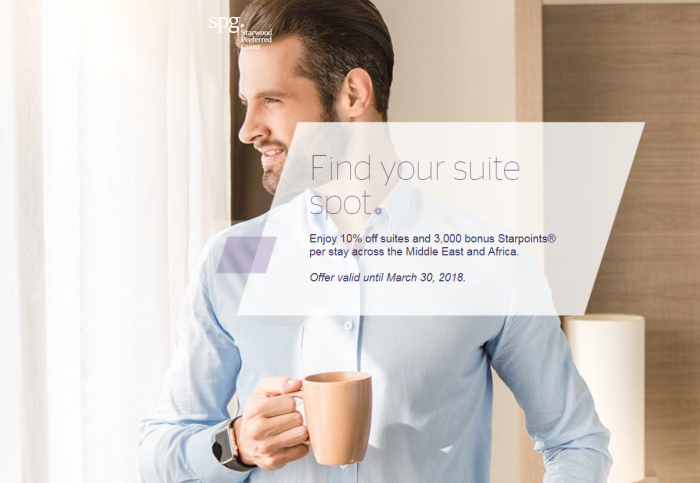 SPG has launched new “Find Your Suite Spot” promotion for stays at participating hotels in Middle East and Africa through March 31, 2018. SPG members can get 10% off of their suite bookings plus 3,000 bonus Starpoints. You can combine this with other bonus Starpoints promotions that are out there. You can access this offer on SPG’s website here. SPG has quote a few of these different rate plans with various discounts and bonus Starpoints amounts. It pays to check what gives the best combination for your stay. Offer is valid at participating SPG Hotels & Resorts in Middle East and Africa. Bonus points are warded once per stay. Guest must be member of the loyalty program the hotel is participating in (Marriott Rewards, Starwood Preferred Guest or The Ritz-Carlton Rewards). A valid membership number must be presented upon check-in to receive bonus points. Bonus points will be credited only if the booking and room reservation is under the member’s name. Offer can be restricted to arrivals in certain days of the week. An eligible stay is defined as one or more consecutive nights paying a qualifying rate in the same hotel regardless of the number of check-in or check-outs that occur. Rates are per room, per night, based on single/double occupancy and availability at time of reservation and do not include additional per room, per night charges that may be imposed or state/local taxes. A limited number of rooms may be available at these rates. Blackout dates and other restrictions may apply. Offer not applicable to groups of 10 or more. Not to be combined with other offers or promotions and subject to change. Not responsible for omissions or typographical errors. Marriott International, Inc. reserves the right to discontinue this offer at any time. Starpoints, SPG, Starwood Preferred Guest, Sheraton, Four Points, W, Aloft, Le Méridien, The Luxury Collection, Element, Westin, St. Regis and their respective logos are the trademarks of Marriott International, Inc. or its affiliates. Mistakes In Finnair’s Facebook Ad?